Closed Kinetic Chain (CKC) exercises or closed chain exercises are exercises or movements where the distal aspect of the extremity is fixed to an object that is stationary. With the distal part fixed, movement at any one joint in the kinetic chain requires motion as well at the other joints in the kinetic chain, therefore, both proximal and distal parts receive resistance training at the same time. CKC exercises have gained popularity over Open Kinetic Chain (OKC) exercises because many therapists believe that CKC exercises are more reliable and functional. Uçar et al. affirmed that for rehabilitation post ACL reconstruction, CKC exercises were more effective than OKC exercises at regaining mobility and enabling a quicker return to daily and sporting activities. CKC techniques emphasise the sequential movement and placement of functionally related joints and therefore require coordinated and sequential muscle activation patterns to control proper joint movement. Closed kinetic chain exercises stimulate the proprioceptive system by proprioceptive feedback to initiate and control muscle activation patterns. Examples include; push-ups and derivatives, pull-ups or chin-ups, and dips. These concentrate on a co-contraction of the triceps brachii, biceps brachii, deltoids, pectoralis major and minor and lower back for stabilisation in various ratios depending upon the angle and leverage. 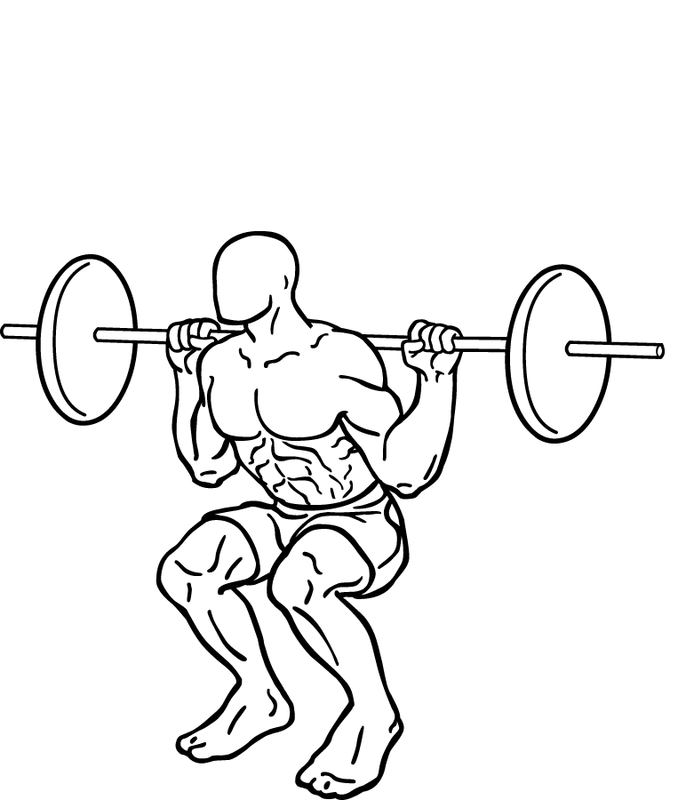 Examples include squats, deadlifts, lunges, power cleans, and leg presses. These concentrate on a co-contraction of the quadriceps, hamstrings, hip flexors, soleus and gastrocnemius muscles. The joints of movement include the knee, hip, and ankle. Many factors should be considered when deciding whether to use open kinetic chain versus closed kinetic chain exercises. The patient's condition and stage of rehabilitation will aid in the judgement of exercise prescription. ↑ Kwon YJ, Park SJ, Jefferson J, Kim K. The Effect of Open and Closed Kinetic Chain Exercises on Dynamic Balance Ability of Normal Healthy Adults. J Phys Ther Sci. 2013 Jun;25(6):671–4. ↑ Bynum EB, Barrack RL, Alexander AH. Open versus closed chain kinetic exercises after anterior cruciate ligament reconstruction. A prospective randomized study. Am J Sports Med. 1995 Aug;23(4):401–6. ↑ Uçar M, Koca I, Eroglu M, Eroglu S, Sarp U, Arik HO, et al. Evaluation of Open and Closed Kinetic Chain Exercises in Rehabilitation Following Anterior Cruciate Ligament Reconstruction. J Phys Ther Sci. 2014 Dec;26(12):1875–8. ↑ Ellenbecker TS, Davies GJ. Closed kinetic chain exercises. A comprehensive guide to multiple-joint exercises. J Chiropr Med 2002;1(4):200. ↑ 5.0 5.1 Akuthota V, Herring SA. Nerve and vascular injuries in sports medicine. Springer, 2009.